HandKrafted by Stephanie: Mojo 227 -- be mine. Mojo 227 -- be mine. Hello! It's time for a brand new Mojo Monday sketch (#227). It's also contest week, so I hope you will join us this week for a chance to win some Verve stamps! Debbie has created a really fun sketch this week! 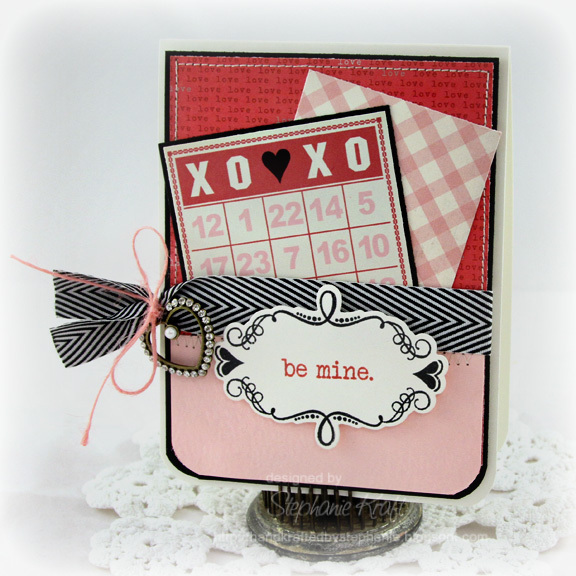 When I first looked at this fun sketch, I knew that I wanted to use the new Verve set, Twitterpated, and the coordinating Hearts & Swirls Frame die. I added a Jenni Bowlin bingo card and a few patterned papers from the Love Me collection (My Mind's Eye). Accessories: A Cut Above Dies: Hearts & Swirls Frame (Verve), Corner Chomper (WRMK), Jenni Bowlin Studio Valentine Card digi kit (Jessicasprague.com), Heart trinket (Prima), Ribbon, Twine (May Arts); Foam tape, Thread, Sewing machine. Such fabulous colours. Love the heart charm - so very sweet! wow, so pretty with the details (sewing, heart charm). This sketch is not making me happy LOL! Love your take on it - can you do mine for me ;) The frame is fabulous as is the love bingo card. Adorable card. Love the colors and elements you used. This is a great sketch. Wonderful card! Really helped bring the sketch alive for me!! This card is precious!!! I love the little heart charm! And the label...fabulous!! This is the cutest card!! Such a pretty card!! Really love the heart charm!! Stephanie, I love this!! Love the bingo card and the fantastic colors! !